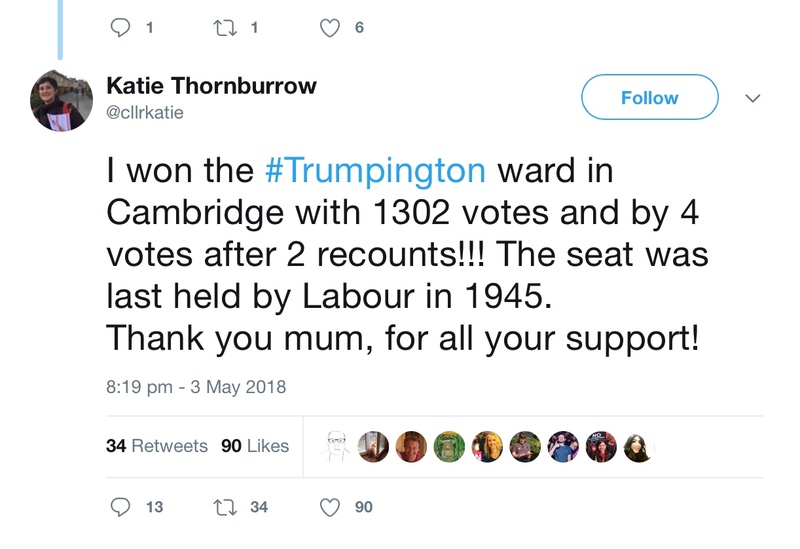 I am very honoured to have been elected to represent Trumpington on the City Council – thank you to everyone who voted for me in what was a nail-biting election. I’d also like to thank my mum, who showed me what a strong woman can do from an early age. Sometimes local councillors get elected and then disappear for four years, expecting to be re-elected because they wear a certain colour rosette. Sometimes they move to Scotland! I promise that I will not be that kind of councillor. I’ve been talking to thousands of you in the past 18 months, and I know your priorities: tackling congestion and traffic, improving public transport, fixing broken pavements, making sure that new communities have the facilities they need. Some councillors promise the world and say that they will sort out every problem and issue. I will be honest with you from the start: I may not be able to fix everything. But I will take every single person’s problems seriously and do everything I can. If I can’t get something done, I will continue to campaign for change, and I will always get back to you and explain the situation. Some of the issues we face in Newtown – such as congestion, pavements and social care – are County Council matters, and your existing Labour county councillor Linda Jones has been working hard over the last year to make improvements. Others are city issues, such as safety, refuse collection and planning. Now Linda and I can work together as a team on city and county issues to identify and deliver on your priorities.